“That is it; I gave it a whirl and this speaking gig is just not for me”. I said it out loud to several. “Its just not for me, I’ve got too much to say and when I say it out loud the words rush and trip over each other and I lose myself and I don’t say anything at all”. Our scars peek out sometimes. Even when He heals and we grow up and out. Even when our branches near reach the sky our broken parts are never wasted. He uses them to bring glory to himself about how he finds beauty in the broken and creates all kinds of good gifts. None of it is wasted. Even when our words fall flat, even when we hurt ourselves, even when we quit…only a God like ours could grow something beautiful from it. and they are talking about forgiveness over here…isn’t the hardest person to extend grace to ourselves??? I love the tattoo to cover the scars. What a beautiful sign of grace. My favorite definition of redemtion is God taking what never should have been and turning into an integral part of the plan. My reaction when I see or experience this is always, always overwhelming gratitude. oh, friend, with a pile of failings in my rearview today, i needed to hear this. Grace. Melissa this is wonderful. I loved this awesome take on the scars we can see and cover with ink, and the scars that sink deeper. 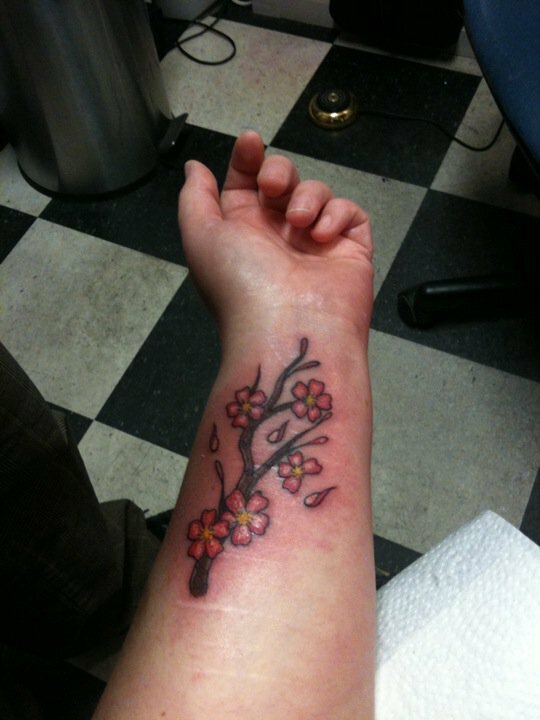 I love the image of that blooming out of pain! What a great God story. Not just a word picture but a beautiful visual, too. This will stick with me. Thank you.